I write to announce to the entire community—students, faculty, staff, trustees, alumni, parents, and friends—an exciting new direction for Lafayette. This direction represents a shared conviction on the part of the administration, the faculty, and the Board of Trustees that Lafayette College is defined by our people and that investing in the quality of our people and the vibrancy of our educational community is the best way to ensure our strength and success in the future. Strengthen financial aid resources to improve access and affordability, with a goal of admitting the most qualified students regardless of their ability to pay. As we all know, a quality education of the kind provided by Lafayette and its peers is expensive. Each year, we are unable to admit many students with outstanding academic qualifications who cannot afford the cost of attending Lafayette. Our plans call for significant increases to our need-based financial aid allocations in the coming years. When we reach our goal, we will join the ranks of the nation’s finest colleges as a place where all students are admitted solely on the basis of their own merit. Lafayette will be known not only for its distinctive, integrated liberal arts and engineering education but also for making that education available to all, regardless of financial means. Grow the size of the student body from 2,500 to 2,850 – 2,900 over six to eight years through a carefully planned and managed process. This year, the College received applications from more than 8,100 prospective students, the highest number of applications we have ever received and a 40-percent increase over the last five years. By increasing our enrollment by 350 to 400 students at this time of strong demand, we have a unique opportunity to simultaneously increase the diversity and the quality of our student body. A larger student body will offer the depth and variety of student interests and diversity of ideas and talents that will strengthen our academic programs. Our goal is to have a student body that is even more accomplished, more diverse, more dynamic, and better prepared to function in an increasingly complex global environment. Maintain or improve Lafayette’s student-faculty ratio and enhance faculty recruitment and retention through competitive salaries. We affirm Lafayette’s long tradition of close student-faculty interaction. As we grow our student body, we will add 35 to 40 new faculty positions in order to maintain or improve our 10:1 student-faculty ratio. These new positions will add unprecedented depth and breadth to our curriculum. In order to be competitive with the best institutions in faculty recruitment, retention, and satisfaction, we will target our faculty salaries to the middle of a group of 25 outstanding liberal arts colleges. These initiatives are the product of extensive study and discussion undertaken by three Presidential Working Groups, composed of faculty, administrators, and trustees who were appointed last fall. Their thoughtful reports, submitted in November, were considered by several elected faculty committees and then by the faculty as a whole, who voted in early February to support the overall strategic direction defined by the reports and outlined above. We believe that the interrelated elements of this plan will combine to catalyze greater change than any single element would accomplish individually and that our vision can transform Lafayette into the college we aspire to be. The goals we have outlined here are ambitious, but they are critical, and the plan we have put forward will bring us additional resources through enrollment growth, strategic management, and focused fundraising as part of our Live Connected, Lead Change capital campaign. I am deeply grateful to the entire community—faculty, staff, students, and trustees—for the hard work that has brought us to this place and for the shared ambition that will launch us into the next phase of our journey. I look forward to working with you in the coming years to make Lafayette College even stronger than it is today. What happened to requiring core competence in western civilization, American history, and foreign languages? Recent surveys have also shown college grads sorely deficient even in basic civics and geography – hopefully not at Lafayette. Too many institutions are obsessed with “the curriculum of the aggrieved”, i.e., class, race, and gender studies (which can be read on one’s own time.) – hopefully not at Lafayette. Lafayette is of course a for profit enterprise and a plan to increase sales volume to offset lower margin contribution per unit is nothing new but technology is ever making alternative education sources with far higher ROI available. If we concentrated on studying WWII how would we have time to read Don Miller’s fantastic book on jazz age NYC? The president is grateful to the “entire community – faculty, staff, students and trustees …” Why weren’t people from the alumni association involved? A bold and necessary strategy. At a time of growing income inequality, the opportunity to benefit from a Lafayette education should not be denied due solely to a student’s financial circumstances. Hard to argue against no. 1 and 3. Go for it. Number 2 is suspect. The three sentences provided as justification contain, respectively, “diversity” / “diversity” / “diverse” — a modern goodness word akin to the phrase “political correctness.” Of course, more students mean more diversity. Whether this translates to “more accomplished,” “more dynamic,” and “more prepared” is in no way a given. One might even offer arguments for the reverse. Generally, the rationale is soft. I attended Lafayette with an all-male population of about 1500 and knew well a HIGH percentage of my 300+ classmates. This engendered a sense of belonging to a group and contributed to my willingness to contribute regularly as an alumnus. The move to co-education resulted in a growth to 2500 (probably would have been applauded by me as an undergrad). 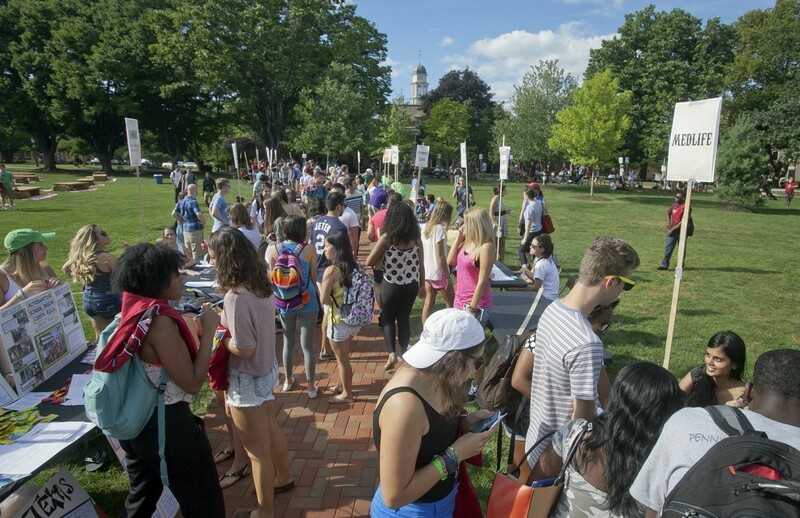 Now a flood of admission applicants prompts interest in adding another 350-400 students that will move the college one step further from an inclusive group. Perhaps the atmosphere of 2500 is only moderately different from my experience of 1500, and 2900 won’t vary much from 2500. However, the next administration could target 3500 students, and then 5000, altogether a different and less attractive school than the one I attended. More candor is needed. One wonders whether number 2 above is present to pay for numbers 1 and 3. I’m a bit troubled by the path in which Lafayette has taken and looks to continue to take. The cost of education should never be a barrier to education, much like someone from an area with less opportunities should be judged by their test scores (traditionally inner-city schools). We must embrace talent regardless of socioeconomic backgrounds, gender, etc. 100% agree. With that said… why are we not emphasizing STEM and bringing LafCol back to the top tier engineering school it once was? STEM professions generally earn more money over a career being able to afford the expensive education – thus setting students up for success rather than a lifetime of debt (even if it is considered ‘aid’). Secondly- the trustees and administration have continued the onslaught against what makes LafCol great – its student body and social opportunities of a small campus. I have taken more away from my experience at Delta Upsilon during my tenure at the college than almost any classroom there. It taught me leadership, risk management, budgeting, Robert’s Rules of Order, social skills, how to be gentlemen (read The Corner Stone) and much more. We must embrace the ‘real Lafayette’ and the soft skills of Greeks, sports, clubs, etc. I really hope Lafayette takes a page out of Dartmouth, Bucknell or Lehigh’s playbook and embrace the whole picture and not just what makes a good headline. The plan brilliantly balances commitments to equal opportunity and academic excellence while positioning the college to move toward a more competitive position in attracting excellent faculty and students. I would love to see it combined with a reshaping of the core curriculum. We need to strengthen our commitments to the study of foreign languages and American history. It is still possible for a history major in European or Asian history, say, to graduate without being required to speak or read the language of the country that student is studying or without a broad general knowledge of the history of the United States. It somehow has not entered the mind of some of the more narrowly focused global studies enthusiasts that the the United States of America resides on the globe. The curriculum study I am suggesting needs to begin in the college’s history department. Recently I suggested to a colleague in the department that the study of World War II would make an excellent global studies requirement, tightly focused in its time frame but audaciously bold in its global scope. That professor looked at me like I was nuts and suggested that such a course belonged under the rubric “military studies.” Well, the war changed the entire face of the world, ending centuries’ old colonial regimes and creating the Atomic Age I grew up in. And it led to fantastic advancements in science, medicine, and technology. It abolished two of the wickedest racist regimes in all of history. Plus, no historic event since the 13th amendment did more to improve the lives of African-Americans. I endorse Prof. Miller’s suggestion re language 100%. One of my great regrets while at Lafayette was not taking more French. How I struggle a bit today to try to ‘relearn’ what little I knew of it. As an Adjunct Prof teaching American Government and World Politics here in Hillsborough County Florida’s Community College, I am appalled at how little our students know about American Government – many think that free public college education and free health care will be just that and cost them and there parents nothing. Our society is in trouble if people voting – including our Lafayette students who are among the ‘best and the brightest’ – do not have any basic idea as to how our government works and why they are really voting for the people they chose. Somehow, unless they test out in advance, they should be required to take a course. Immigrants who have to take the citizenship test know more! I greatly enjoy reading your WWII history books – it was Lafayette that gave me my love of history and my subsequent focus on military history. A WWII-focused program is a great idea and could bring together components from history, government, literature, economics, science, engineering, etc. at Lafayette. I once taught a freshmen course like this; it was developed around four basic themes. Best wishes. Bravo to President Byerly for leading LAFAYETTE into the 21st Century. This is the right move for the college. Excited for Lafayette and future students. This is a comprehensive plan that requires continued deep commitment of support to Lafayette by Alumni and Friends. We have another reason, here, to celebrate the official charter of Lafayette on March 9th. Let’s crack out ‘The Bubbly’, at “Wine 3/9”! On, Lafayette! Unless there are plans to build 2 or more new residence halls, there is no space on campus to fit 400 extra students. As an alum who is currently touring Lafayette and other similar colleges with my high school junior daughter, I feel very strongly that these are very positive changes for Lafayette. A true strategic plan at last. I applaud this!! This might be the college’s boldest move since the admission of women.